Do Du think Elena has any feelings toward Damon? If so what are they? I generally agree with DaniKatZ. There's definitely something going on between these two, even if it's not "official" and they try not to Zeigen it. Elena is attracted to Damon, but at the same time she's afraid of it...Damon is pretty dangerous after all :D With him, Du can never be sure of anything. Elena is aware of that, but she also knows that he wouldn't hurt her :) Sooo I really hope Delena is cominggg!! could'nt agree with u better. :) delena!! Yeah she dosn't Liebe him yet but she will. But i only want it to be brotherly Liebe cause i Liebe stelena!!! love...not yet...she def cares about him alot and i think they have a physical attraction to one another. I think she does, if u saw a few good men, that scene with her and damon was like u could see in her eyes and stuff that she likes him and has some feelings toward him. I think that they will get very close at one stage of the show. But altogether, Elena has feelings for Damon even if she tries to hide it. DELENA! i think that she does.. she doesn't want to admit them since she is with Stefan. 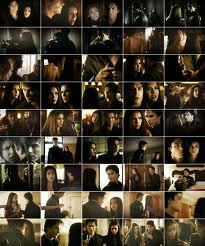 I think that Elena likes that Damon is always there for Stefan and finds it admirable. However i dont think that Elena has any other feelings for him. I think they do because there's an attraction going on between them because Damon wanted to KISS Elena in Founders Day,but i know she loves Stephan no matter what. No i don't think she has feelings but i think she has some attraction to him. Well as much as I hate to admit it...because Im a huge Stelena fan...but yes there is a connection between Elena and Damon....but I still Liebe Stelena to pieces!!!! But I don't think she's aware of her feelings yet. Yes there are feelings between the two. Elena cares about him Mehr then she can admit maybe even loves him but doesn't realize it. If Elena really had no feelings for Damon and just an attraction She definately would never want to be around him after 2x01. Elena keeps allowing Damon to be in her life even tho he does terrible things intentional oder not. That's why what they have is Mehr then just a physcial connection. She has an emotional one. Nina dobrev in a Kürzlich interview admits that she doesn't know which brother Elena should be with. both give her different things. This tune has changed alot with her i remember she used to kind of side with Stelena. He is her true Liebe but now she's not sure. TO me that is proof that Damon and Elena have something true and deep. I think elena does have feelings towards damon... shes too afraid to Zeigen then.. because she's also in Liebe with Stefan. Elena likes Damon as a friend, but after Stefan "leaves" them, they'll be together. To me it's love, she has always cared for Damon. Don't hate me but Stefan really should have seen it coming. yeah, she does but she still fighting this feeling!!!!!!!!!!! yes because its so clear that she still loves him.